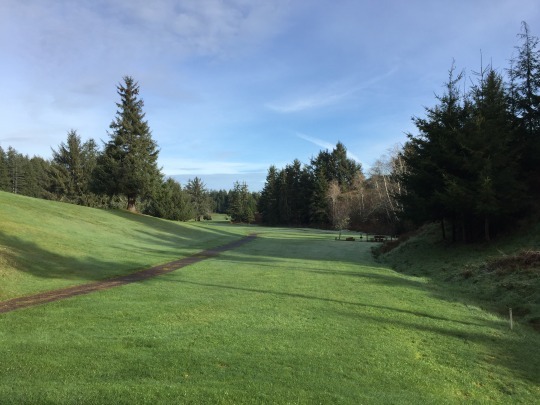 After a few days with no golf over the Christmas weekend, I was back on the road Monday. I was set to drive up the Oregon coast and visit a friend in Toledo (just outside of Newport). 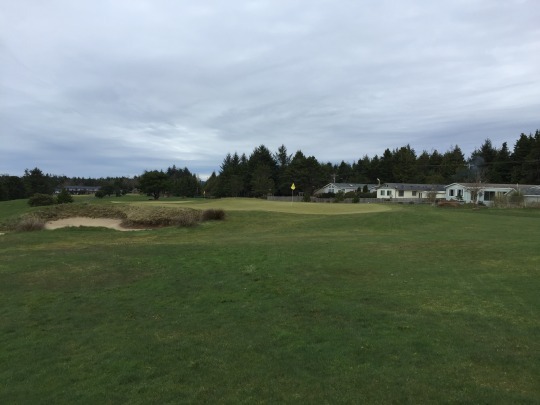 Though I’ve played most of the notable courses along the coast, there were still plenty of lesser-known options for me to check out. Most of them are 9-hole courses, so I made my master list of everything I needed to play from south to north and I’ll see what I can get accomplished over the next few days (weather permitting). The weather is tricky here because when it’s not pouring rain it is usually very cold. 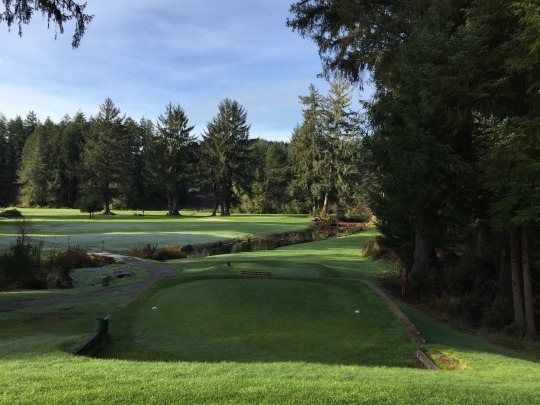 Frost delays and wet overall conditions are just part of play in Northern California and Oregon this time of year. 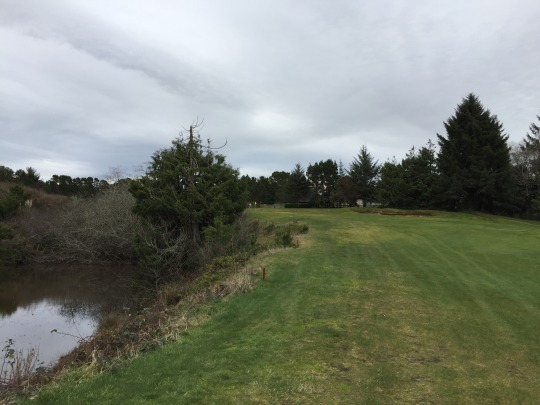 My primary target for yesterday’s drive up was Watson Ranch Golf Course in Coos Bay. 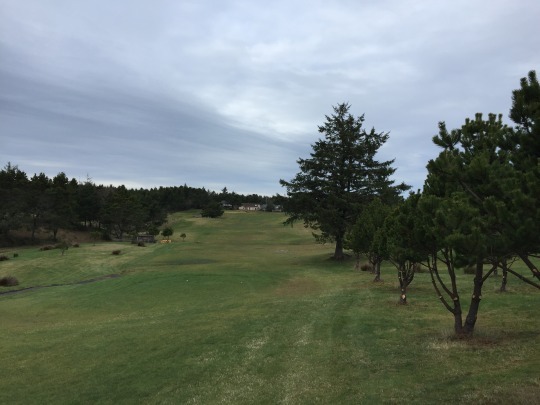 It is the only remaining public regulation 18-hole course I haven’t played on the Oregon coast and it looks like a really cool course. I wanted to play as early as possible since it was only about halfway to my ultimate destination for the day. Unfortunately, the course was completely frosted over. Nobody was even in the pro shop and the place was basically a ghost town. I did get a cool picture, though. 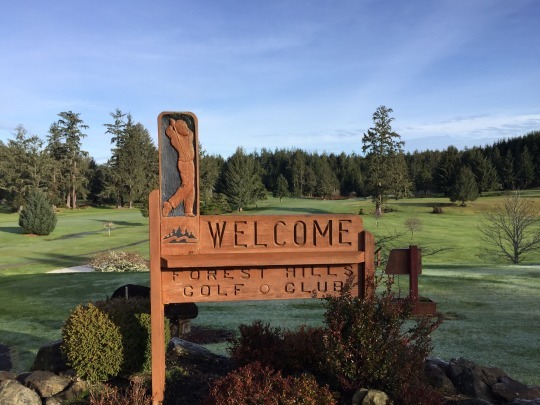 Forest Hills was the next course on my list geographically, so I stopped in to check it out. 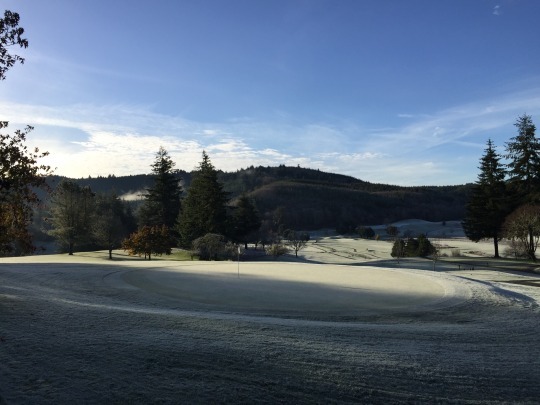 There was still frost clearly on the greens nearest the clubhouse, but I poked my head inside to see what was up. They were in a frost delay and the guy said it may be another hour. 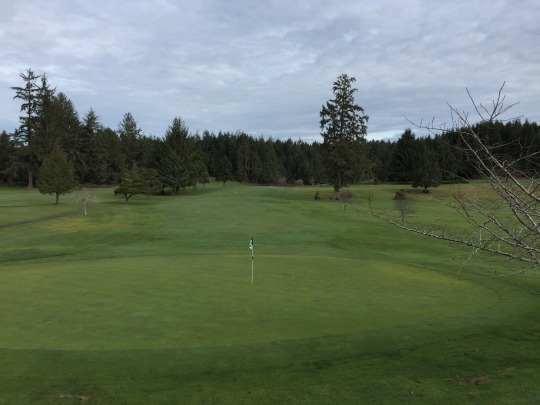 After we talked for a little bit, he looked out and saw that the first five greens were pretty much thawed, so he let me go off by myself figuring the others would be playable by the time I got there. 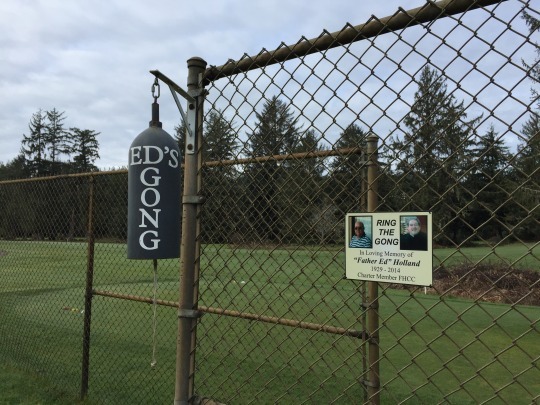 The 9-hole walking rate was just $10. It was pretty soggy out there, but fine enough for winter. 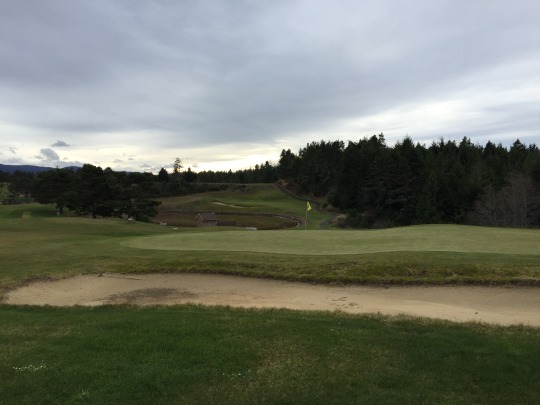 Otherwise, the course was very lush and green, so it presented nicely visually as you’ll see in the pictures. It just played longer with such wet conditions. 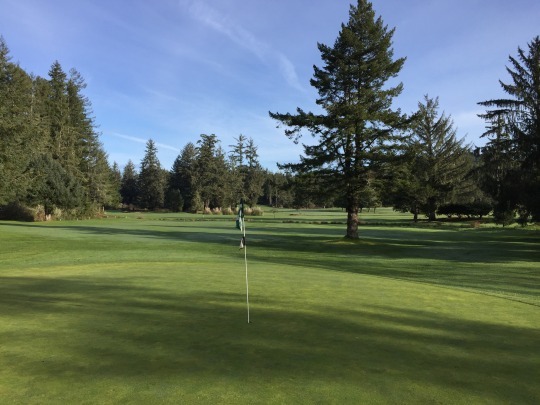 By the time I got around to the 6th hole, that green was still a bit frozen. So was the 7th. 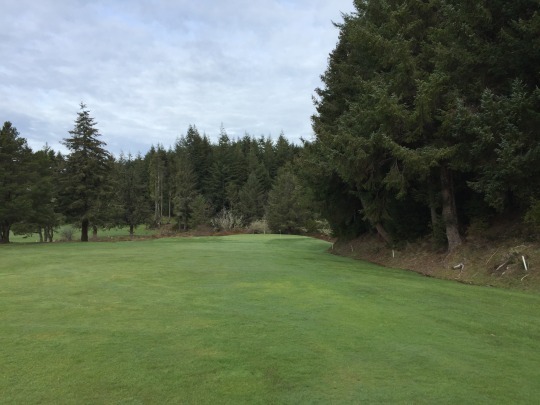 I was encouraged not to really putt out on those holes, which was fine because I wanted to keep moving without further delay. Forest Hills is a 9-hole regulation layout (par-36) playing through some rolling hills and trees. It is a very pretty setting. 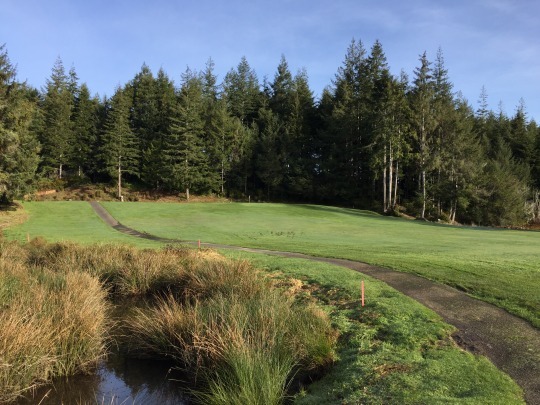 The design is well done as it gives you a good mix of hole shapes and lengths, with some longer, more demanding holes and a few shorter birdie holes. There are some creeks and water hazards to contend with. The greens have some tricky undulation, as well. Overall, it’s not a course that will beat you up too much, but it offers enough challenge to keep you interested. 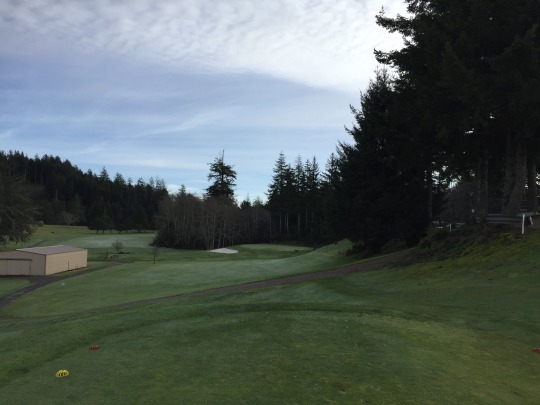 9-hole courses are pretty common throughout Oregon and Northern California, and it’s courses like Forest Hills that make you appreciate the more efficient set-up. 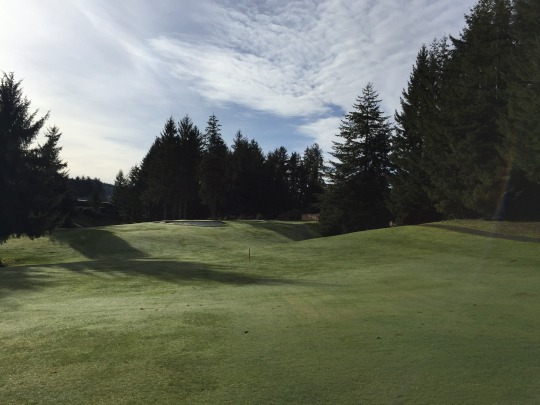 If this were a full 18 holes, the course would undoubtedly get more attention and acclaim. 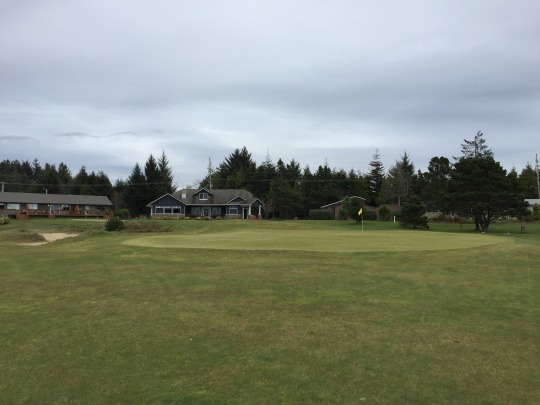 However, it’s primarily designed for local players while providing a nice place for visitors to tee it up while in the small coastal town of Reedsport. All in all, Crestview Golf Club has similar appeal as Forest Hills, though this one is a step down in my opinion. 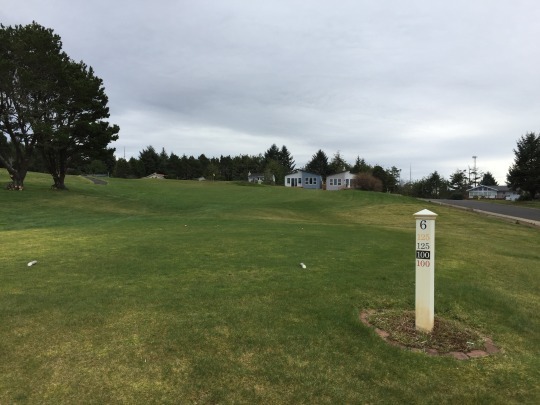 It is a locals’ course that probably doesn’t get much outside play because of its location and the fact it is also a 9-holer. 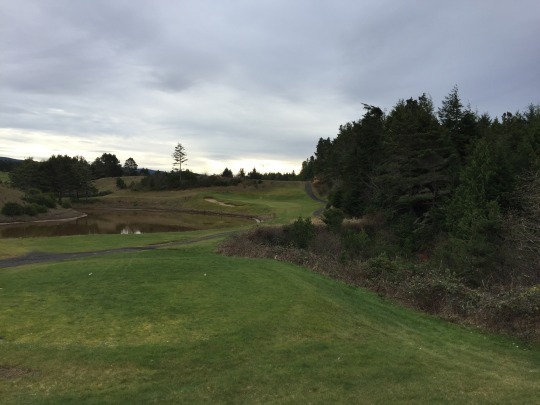 For what it is, though, it’s another fine little course along the Oregon coast. There was hardly anyone here, so I decided to squeeze in a quick afternoon round. The walking rate for nine holes was $19, which seemed steep compared to what I paid at Forest Hills. They weren’t allowing carts out, not even cart-path-only, but they did offer me a free pull cart to use. 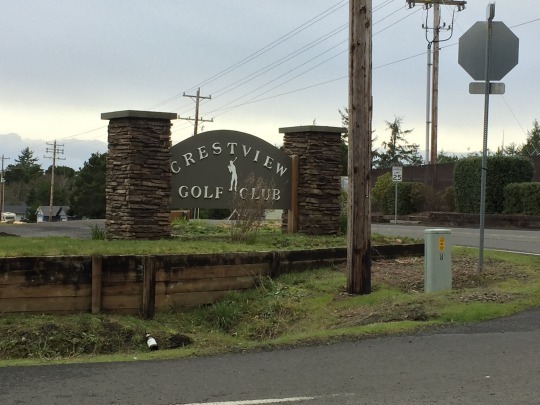 Design-wise, Crestview is a very different style course than Forest Hills. 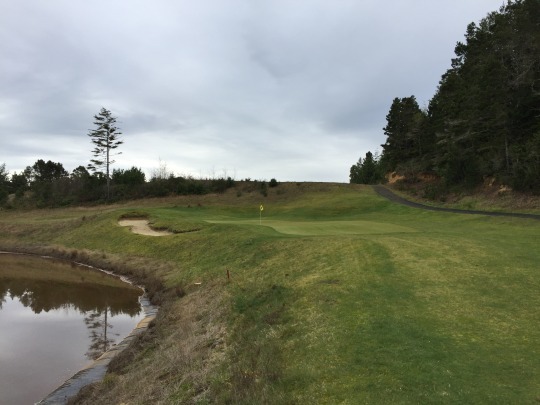 Whereas that course has the quintessential inland Oregon “forest” feel, this one captures the coastal Oregon “dunes” feel. 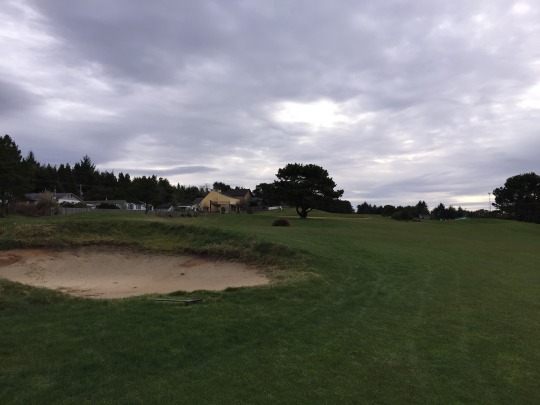 It’s probably most comparable as a poor man’s version of Sandpines Golf Links in nearby Florence or maybe more of a 9-hole counterpart to Ocean Dunes (also in Florence). The layout at Crestview is pretty open with a small dose of trees scattered throughout and not really too much in play. It is fairly hilly with rolling terrain. It definitely has a somewhat linksy feel, especially around the bunkers and severely undulated greens. It is nine holes and plays to a par of 34. I usually consider par-35 or higher to be “regulation” length. Crestview falls a bit short of that, but still feels enough like a regulation course when you play it. The par-4 holes in general are on the short side, but the one par-5 and three par-3s are legit. Speaking of par-3s, the standout hole at Crestview is easily the 4th. 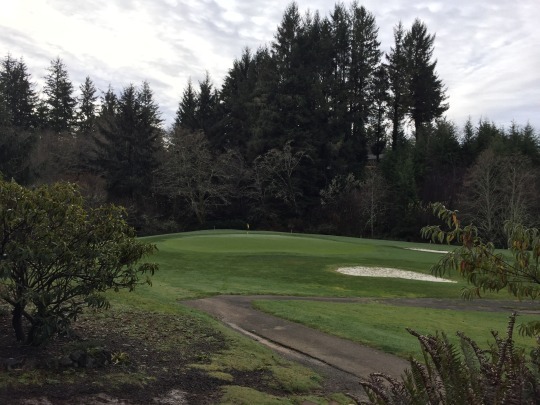 It plays over a water hazard and has a nice-looking green complex with multiple tiers. The 9th hole is also a par-3 that is quite beefy, topping out at 245 yards from the back gold tees. It is pretty wide open and I wonder if it was a short par-4 at some point, explaining why the course is now an awkward par-34. Conditions here were also pretty wet, but this course is designed to drain fairly well since it is built on the dunes. 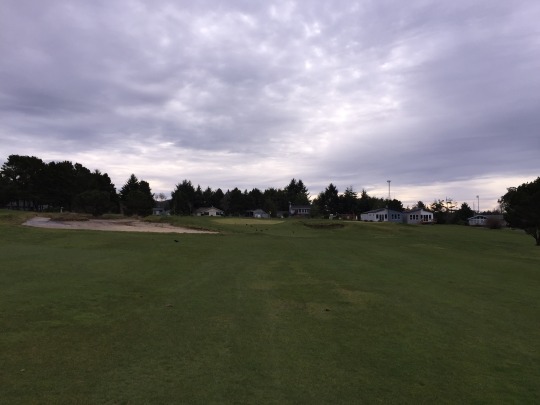 It features all fescue turf, though things were a little rougher around the edges than you’ll find at Bandon Dunes or Sandpines this time of year. The greens were very soft and rolling well at medium speeds. Many of the bunkers were flooded, so I did my best to avoid those. 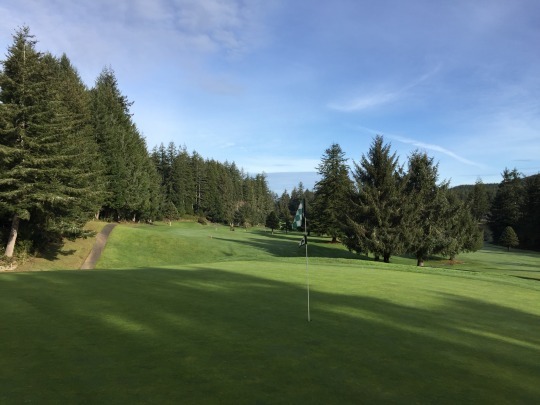 Whereas Forest Hills is a 9-holer I’d consider stopping to play again in better weather/conditions, Crestview is clearly a one-and-done for me. It’s actually a pretty decent course that anyone can enjoy. It’s just not one I’d make much of an effort to play again unless I lived around here.